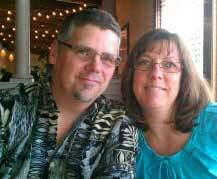 We have been living and working in the beautiful Willamette Valley for over 20 years and enjoy serving our local community here in Salem, Oregon as well as our great customers across the country. We love travel, classic cars and trucks and spending time with family and friends. My background is in precision sheet metal fabrication and TIG welding. For a number years before I started G&G Custom Metal Fab, I worked for several large companies in other capacities. I was involved mostly in administrative roles like outside sales, account management and shop supervision, but I really missed getting my hands on the metal and I have always wanted to start my own business. Most of all, I enjoy the creative process, and I guess you could say that I have a passion for making things with metal. Our primary piece of equipment in the shop is a CNC Plasma3 System from B&B Systems. B&B Systems is located in McCall, Idaho and was founded and still owned by my dad and brother. Dad has more than 30 years experience in electronic engineering and industrial controls. He got into CNC Plasma Cutters when he helped a friend of his make repairs to a CNC system that was not working. Dad believed he could make a better machine and one that would be much more affordable. After using my CNC for the last two years, I can say that he was right on. The 4X8 CNC Plasma3 Table from B&B Systems has been a fantastic and reliable machine. The table is 128” long X 78” wide X 48” tall which allows me to cut from a full 4’X8’ sheet. B&B Systems uses all-steel frame construction so it’s super heavy-duty and durable. All the plasma cutting tables are built as water tables that trap smoke and other airborne contaminates but can also be used without it. The CNC is great for cutting plate steel, copper, brass, stainless steel or aluminum. It’s a really nice industrial, small shop CNC Plasma cutting machine. For precision cutting at high speed, it is tough to beat a jet of superheated gas blown through an electrical arc. Our CNC plasma table is a computer controlled cutting platform used to cut steel and many other types of metal without deforming the surface. 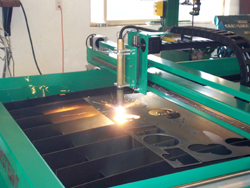 CNC plasma cutters can be programmed with a preset routine and then supplied with a sheet or surface of metal and then left to do its work. The plasma produced when the gas passes through the cutting jet’s electrical arc at high speed is the result of the arc traveling from the nozzle to the surface and ionizing the gas along the way, and this produces such enormous heat that molten metal is blown through the air and evaporated so that it does not clump or reform around the edges of the cut. This produces a slick, clean edge. Great for a large variety of commercial and private metal-working applications. Interested in a B&B Systems Machine? If you’d be interested in purchasing a CNC Plasma Cutter please provide some information and I will be in contact soon!